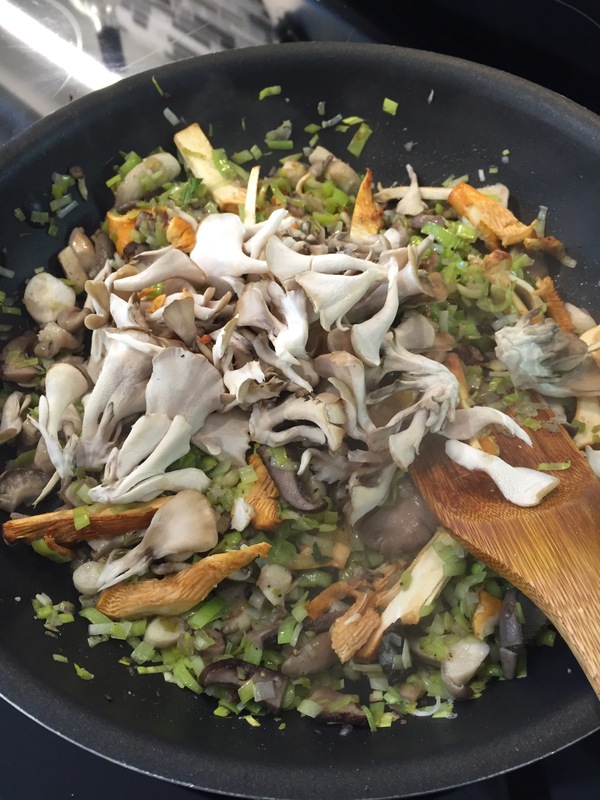 Seems a recent photo of mushrooms piled high in a skillet while making a little leek and wild mushroom appy made many salivate after I shared it on Instagram and Facebook! 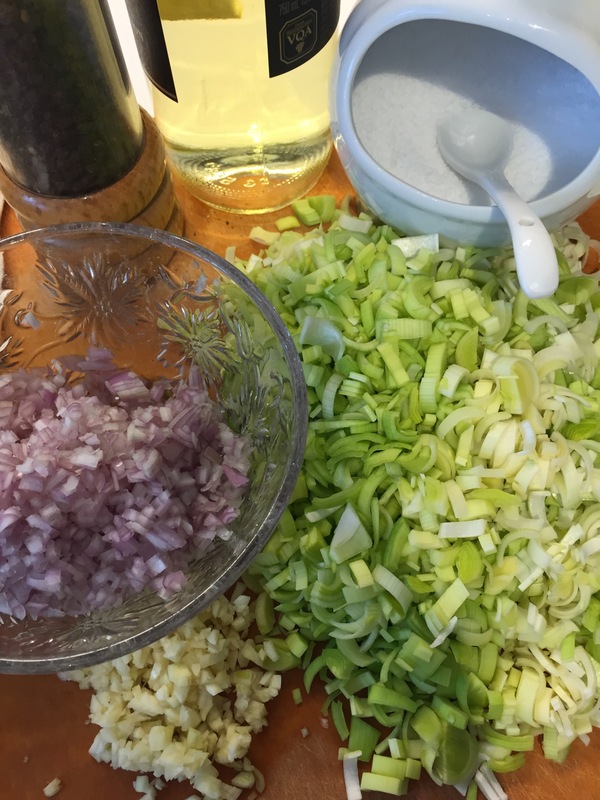 I have received a few requests for the recipe… Normally, and if I hope to share or blog a recipe, I plan a little better, taking proper measurements and jotting everything down as I go. I turn on the OCD part of my personality. Hence the reason why I do not post recipes as often as I wish… This was not one of those times… It was more like letting loose and allowing all the unchained creativity flow right out of me like I often do. I find I use recipes more as a source of inspiration as opposed to following them to a T unless the recipe calls for a new technique, is about baking, taps onto a food group or recipes I am unfamiliar with or originate from other cultures and countries than my own. One of my favourite things to do is scan my fridge and pantry at the end of the grocery cycle and whip up something using what I have on hand. Some work beautifully and if I am in that mood, I will jot down the recipe for later use. Some concoctions turn out «Meh» but are good enough to feed the fam without anyone gagging too much. Ok, slight exaggeration here but I can honestly say that once in a blue moon, some meals bomb right out… Yup, even in my home LOL! You know you didn’t nail it when left overs linger in the fridge until they become science experiments. This «feuilleté de poireaux et champignons sauvages» is exactly the type of food I can whip up directly from brain to plate without measuring anything. It is such a classic French inspired preparation… I must have watched my mom make something similar many times over the course of my life. Anything in puff pastry becomes a gourmet dish right??? And unless someone doesn’t like mushrooms, this one in particular is always a crowd pleaser. French restaurants and Bistros often offer something or another “en croûte”, “napoléon” or “feuilleté” to the delight of the diners. Since I “ad lib” this once from start to finish, I am sharing with you only in approximation ingredients measurements with the general order of prep but I warn you, this recipe is not precise. Now I have the utmost confidence in everyone and I am SURE most of you have enough kitchen skills to figure it out. I have added several photos which offer a pretty good idea of overall the quantities of each ingredient. The Shrooms are in town!!! 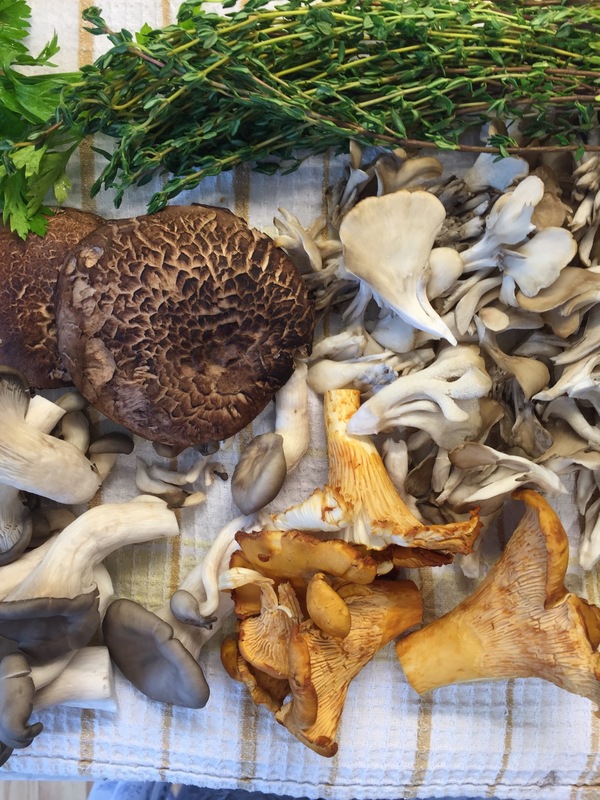 I selected an assortment of wild mushrooms since most are in season right now. You could make this using good old white button mushrooms as well. I also splurged on crème fraîche which is easy enough to find: Liberty™ makes one but if you can find an organic one, it is well worth the extra few $$$. No crème fraîche, no worries: heavy cream or whipping cream will do as well. This is NOT a calorie reduced appy. It is meant to be rich and sinfully delicious. You can substitute for low-fat everything but it won’t be the same. An assortment of mushrooms. I used several large chanterelles, a stryro flat of oyster mushrooms plus 3 other mushrooms I can’t remember the name but could pick out in a crowd if I had too, except picking my own in the real wild, that I wouldn’t trust LOL. Anyhow, one was a purple something and I heard it was rare although it was cheaper in price than the chanterelles. The others had Asian names but they were not shiitakes. Just have fun with the mushrooms and pick what is available and looks cool. Quickly rinse mushrooms in water and lay them down on a thick kitchen towel. I don’t like to simply wipe the mushrooms as most chefs suggest: there is always grit that stays behind. The trick is to rinse quickly and not let the mushrooms soak in the water as they will absorb too much. Chop the mushrooms last to let the kitchen towel absorb most of the water. 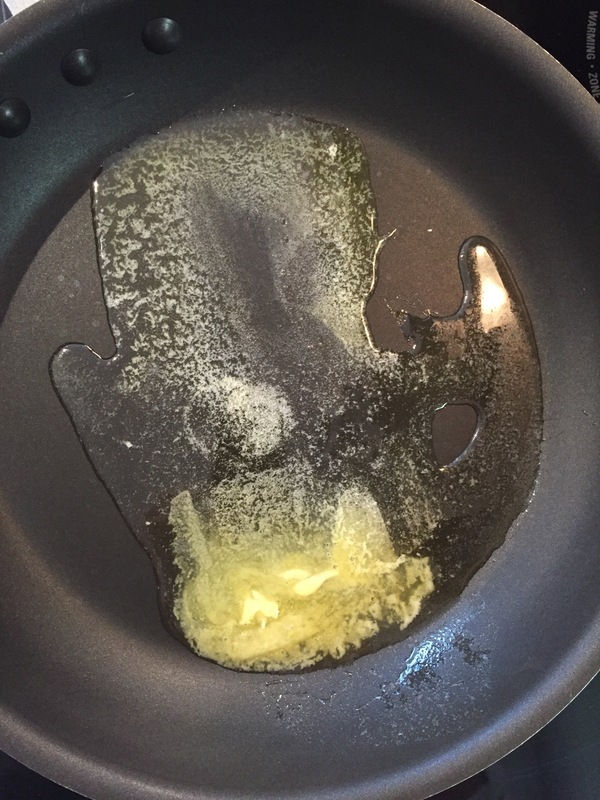 In large skillet, melt butter and olive oil until it start to bubble a bit. Keep heat at medium. 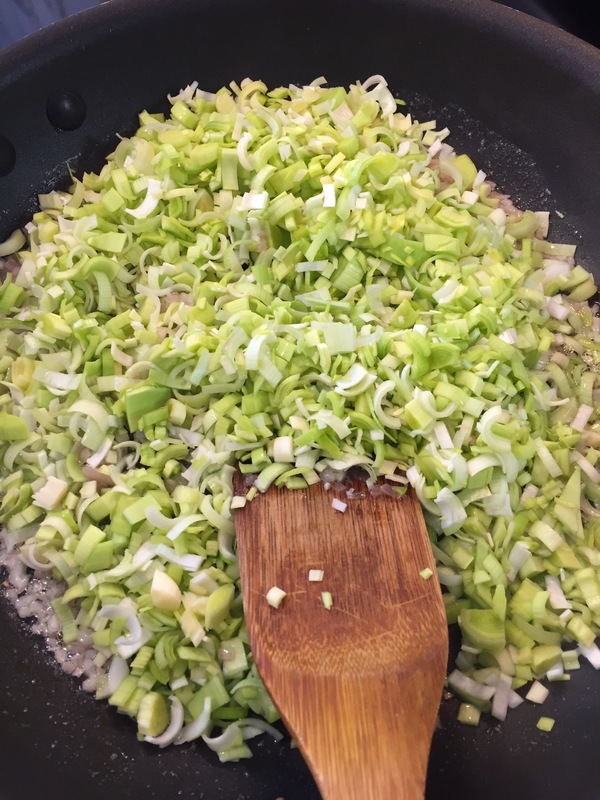 Add shallots until soft then leeks, also until soft. 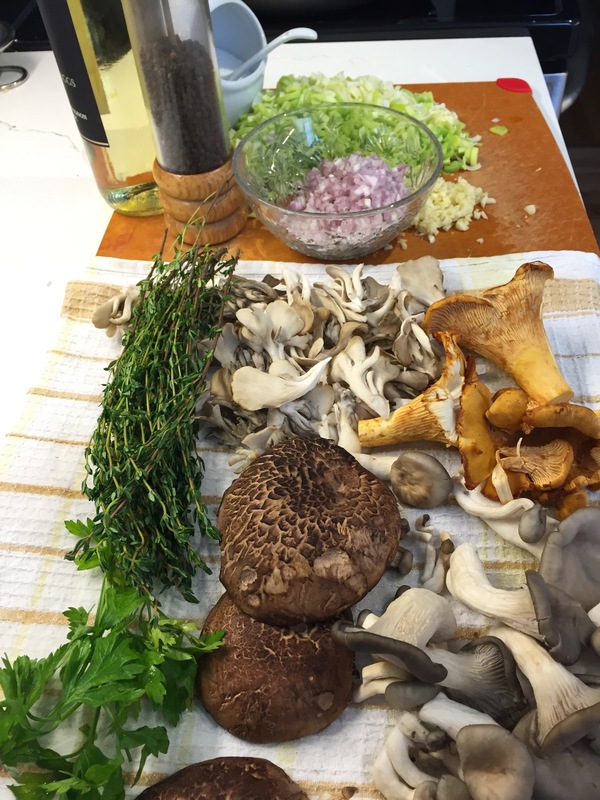 Add mushrooms, one kind at a time starting with the hardiest ones. Add garlic. Stir often. Add thyme, salt and pepper. Taste! Add wine and let reduce until liquid is nearly all evaporated. NB: You can make up to now and refrigerate until you are ready to serve your guests. Finishing touches just before serving: add crème fraîche and heat gently until it starts to bubble. Do not boil, just a gentle little froth of bubbles should appear on the edges. The preparation will thicken: loosen up if needed with cream, either half & half or heavy cream . Taste again but don’t eat it all right there and then, your guests are waiting hahaha! Add fresh parsley and chives. 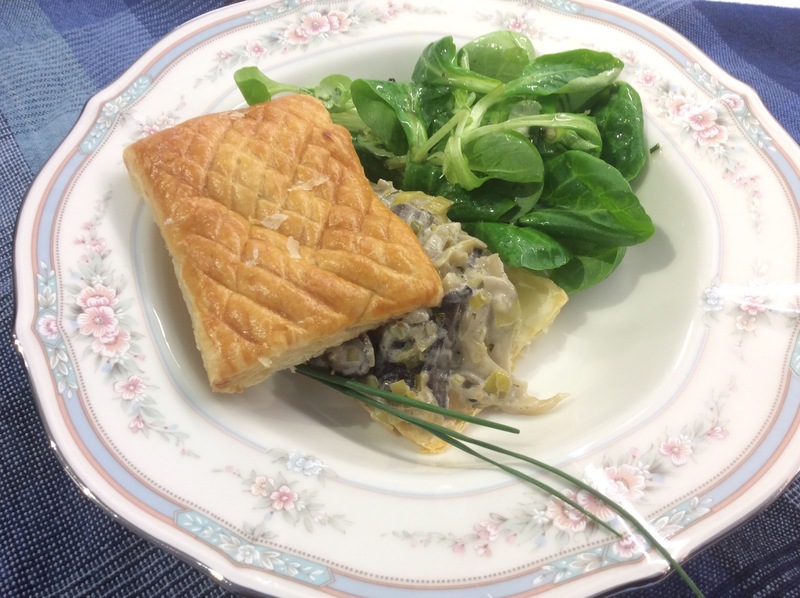 Serve on puff pastry shells which you would have baked prior. In this case, I bought frozen puff pastry sheets. I cut out rectangles which I lightly scored on top in a crisscrossed pattern and brushed some egg yolks on top. I baked them at 375°F for about 20 minutes, until they became golden brown. After they had cooled down, I used a thin blade knife to separate the bottom and the top. At service time, lay the bottom of the shell on a plate, spoon on a generous amount of leek and mushrooms then crown with the top shell. Lay a few strands of chives and serve as is or with a quick salad of tender greens tossed in oil and vinegar. Slide your plates in the oven at the same time: warm plates are a nice bonus for this type of appetizer.